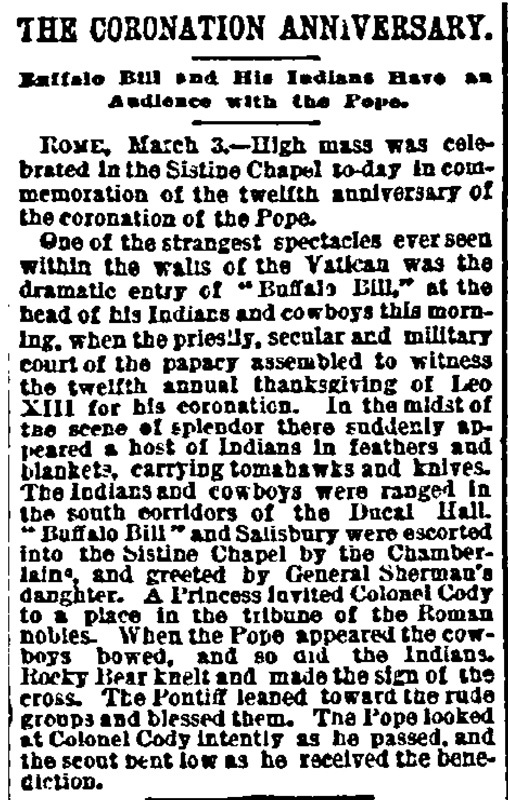 Buffalo Bill and His Indians Have an Audience with the Pope. ROME, March 3.—High mass was celebrated in the Sistine Chapel to-day in commemoration of the twelfth anniversary of the coronation of the Pope. 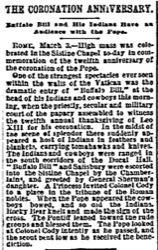 One of the strangest spectacles ever seen within the walls of the Vatican was the dramatic entry of "Buffalo Bill," at the head of his Indians and cowboys this morning, when the priestly, secular and military court of the papacy assembled to witness the twelfth annual thanksgiving of Leo XIII for his coronation. In the midst of the scene of splendor there suddenly appeared a host of Indians in feathers and blankets, carrying tomahawks and knives. The Indians and cowboys were ranged in the south corridors of the Ducal Hall. "Buffalo Bill" and Salisbury were escorted into the Sistine Chapel by the Chamberlaine, and greeted by General Sherman's daughter. A Princess invited Colonel Cody to a place in the tribune of the Roman nobles. When the Pope appeared the cowboys bowed, and so did the Indians. Rocky Bear knelt and made the sign of the cross. The Pontiff leaned toward the rude groups and blessed them. The Pope looked at Colonel Cody intently as he passed, and the scout bent low as he received the benediction.